Last night we were supposed to get pounded with one hell of a storm. People were going to wegmans in hoards to stock up on milk, bread, and condoms. The meteorologist even suggested you have flashlights and candles ready in case the power went out. Schools and daycares had closed the night before in anticipation of the bad weather. We were warned that this could be one of the worst storms we’ve seen in 30+ years. I work about 25 miles from where I live and I have the ability to work from home, so last night I determined that Cardin and I were going to have a self imposed snow day and I would just tele-commute. Listen Lady, you would think a meteorologist would know the difference between 6 and 16 inches of snow. Since Cardin is nursing an ear infection and I have caught her head cold I decided we were still staying home; not spreading it to the remainder of the office would be appreciated. I was able to work from home and be overly productive, while Cardin destroyed the living room. This is how she rolls when she needs to entertain herself. It looks like Toys R Us exploded. Sometimes I think she has a certain quota of toys that she needs to play with each day as she’ll spend 20 minutes on one thing and then move to the next; all without picking up the first toy. 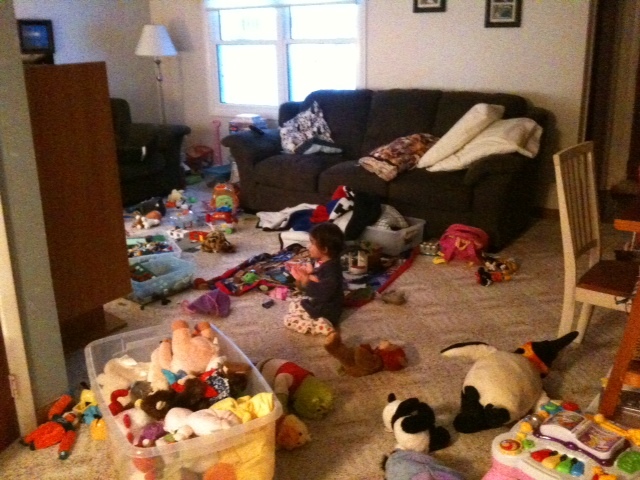 My payback for the destruction….we play “lets see who can pick up more toys. Mommy or Cardin?” I’m helping to develop a competitive spirit.